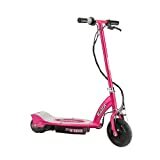 Razor Pink E100 Scooter , selling for $259.98 brand new. Manufactured by Razor. There are 1 units left brand new. It can go up to 10 miles per hour. 40 minutes of continuous use. It has a 125mm polyurethane rear wheel. Item dimensions are 32.5″ x 16″ x 36″ – weight 29lbs. The Razor Pink E100 Scooter is every girl’s dream ride! It is the perfect way to get around and have fun too! The Razor Pink E100 Scooter is environmentally friendly because it is electrically powered. It is also super quiet, so your neighbors will love it too! The Razor Pink E100 Scooter has a kid sized deck and is super easy to ride! It can go up to 10 miles per hour and lasts for up to 40 minutes of continuous fun! The Razor Pink E100 Scooter has twist-grip acceleration control and a chain driven motor. It has a 24 volt(2 12 volt) sealed battery system that recharges in 12 hours. Battery charger is included. The Razor Pink E100 Scooter also has a 125mm polyurethane rear wheel. It can hold riders up to 120lbs. Assembly is required. Item dimensions are 32.5″ x 16″ x 36″ – Weight 29lbs. Founded in June 2000, Razor USA, LLC is a privately held company based in Cerritos, Calif. and holds the worldwide rights to the Razor brand. Home of the wildly popular Razor kick scooter, Razor has other scooters like the E100, E200, and E300 (electric scooters). The cutting-edge line of Razor products also includes the Dirt Rocket, Pocket Mod, Pocket Rocket, Ground Force, a line of electric powered ride-on toys and a junior line of scooters. Razor also offers an action video RVM, featuring Team Razor (pro scooter athletes ages 9 to 20, who tour the world participating in demonstrations and competitions). Razor has numerous awards including Toy Industry Association’s “Toy of the Year,” and “Toy of the Year” honors from TIME Magazine, Parents, Parenting, Sports Illustrated for Kids, Nick Jr. and U.S. News & World Report.